Until a year or two ago, I didn’t do much writing on a notepad. It generally went straight into a computer unless one wasn’t handy. I began to use a pad extensively for two reasons. Firstly, my small laptop has only just enough RAM to run Windows and was a pain to use. Secondly, I type extensively in my day job and my fingers began to hurt, whereas holding a pencil was a sufficiently different motion and it didn’t hurt. Using a pad is also a different experience from typing: It slows down your thoughts so you become more focused on what to say next. It also looks less like a finished product and I’m more inclined to edit it. Furthermore, it’s easier on the eye to read paper than a screen. Kids of the 22nd century: these are called books, which are a bit like websites on paper. My fingers aren’t nearly so bad now, but I’ve kept up another habit I fell into during this time. 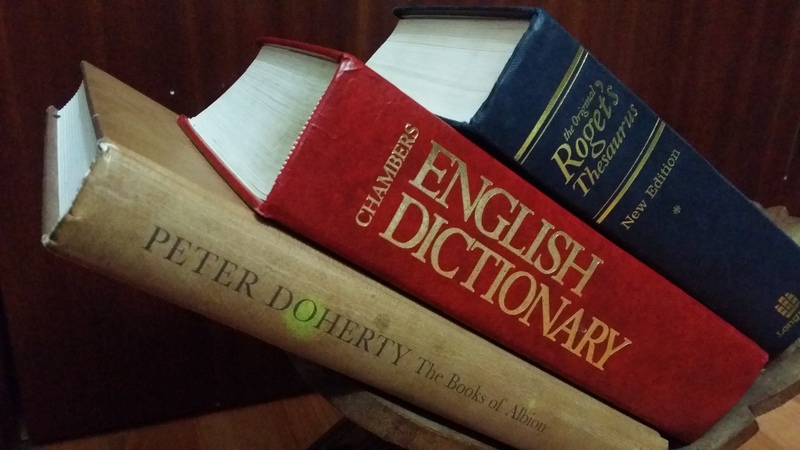 I dug out my printed dictionary and thesaurus. Online references generally focus only on the words searched for, whereas flicking through a book can throw up possibilities from other pages. The trade-off is that paper references go out of date – mine are over 25 years old, but I rarely need new-fangled words. On Saturday, it’s the 37th birthday of one of my influences, Peter Doherty. I feel compelled to point out that he prefers Peter over Pete. Last year, I bought The Books of Albion, containing writings from his many notebooks. I expected to read drafts of his poems and songs in there, and I wasn’t disappointed. But he also includes a lot of diary entries, many of them with the dates on which they were written. He talks about what’s happening to him at the time, whether it be relationship problems, a budget trip to Germany, or his first professional poetry gig. I stopped keeping a diary when I was about 20, and started a blog on the relatively young LiveJournal. Almost overnight, my style changed from private and unguarded to public and slightly more guarded. I still have some of the diaries but they’re unlikely to be available in the shops any time soon. By contrast, Doherty’s diaries start when he was about 20, so there’s a maturity in them that mine don’t have. Yet it’s still clear he never intended them for publication, and it’s perhaps this honesty that makes his writing so compelling. Initially, I found myself thinking back to what I was doing around the time he was keeping his notes. Then I began to wonder whether I could experiment with bringing back my pre-LiveJournal days and writing the occasional dated diary entry in my current pad. It contains mainly poem and story drafts, yet true events are at the heart of many literary works. I would then have some events to draw upon when I need ideas. Previous Previous post: The milestones of a masterpiece. Next Next post: How to manage a writing group.